My first close encounter with Paul Usoro, SAN, left in me till this very moment, an indelible pictorial imprint reminiscent only of one of the scenes in Frederick Forsyth's books. It was in the Supreme Court of Nigeria, sometimes around April, 2015. As usual, the court was filled to the brim and everyone waiting eagerly for 9.O'clock for the court to start the business of the day. I was on the first seat on the third row flipping through my file when suddenly I felt a cool gentle breeze blow beside me with this flowing gown almost brushing my shoulders with this harmless gentleness. 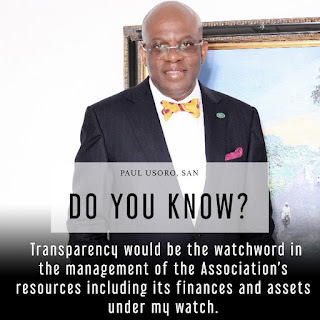 Join me, let's vote Paul Usoro, SAN as president of the NBA.